The 19th Special Forces Group is one of two National Guard groups of the United States Army Special Forces. Headquartered in Draper, Utah, with detachments in Washington, West Virginia, Ohio, Rhode Island, Colorado, California and Texas, the 19th SFG shares responsibility over Southwest Asia with the 5th Special Forces Group, and the Pacific with the 1st Special Forces Group. The parent unit was constituted on 5 July 1942 in the Army of the United States as the 1st Company, 1st Battalion, Third Regiment, 1st Special Service Force, a combined Canadian-American organization. This unit was activated on 9 July 1942 at Fort William Henry Harrison, Montana, then disbanded on 6 January 1945 in France. 19th Group was constituted on 15 April 1960 in the Regular Army as Headquarters, 19th Special Forces Group, 1st Special Forces. 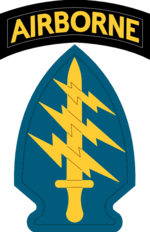 One year later, on 1 May 1961, the unit was allotted to the Army National Guard; 19th Group was concurrently organized from existing units in Utah with headquarters at Fort Douglas. Continuous reorganization developed over the next three decades, and by 1 September 1996, the unit consisted of elements from the Utah, California, Colorado, Ohio, Rhode Island, Washington, and West Virginia Army National Guards. On 1 October 2005, 1st Special Forces was redesignated as the 1st Special Forces Regiment. Today's unit designation - Headquarters, 19th Special Forces Group, 1st Special Forces Regiment - was then established. 19th Group operators attend the same special operations training as their active duty counterparts. The unit deploys elements to conduct special, irregular, and counterterrorist operations in various places around the world. Their official motto is De Oppresso Liber (Latin: "From oppressed [to] free"), a reference to one of their primary missions to train and assist foreign indigenous forces. In September 2014, the Huffington post reported that members of the 19th SFG were deployed to Camp Ram Ram in Morocco to take part in Operation Enduring Freedom – Trans Sahara. Green Berets from the 19th SFG took part in the War in Afghanistan (2015–present); A Company, 1st BTN, 19th SFG was deployed to Afghanistan in July 2015 and several members were decorated for their actions during December 2015 and January 2016. On 5 January 2016, during a major operation assisting Afghan forces reclaiming territory held by the Taliban. SSG Matthew McClintock of A Company, 1st BTN, 19th SFG was killed by small arms fire during an hours long battle in the Marjah district, Helmand Province. Soldiers from the 19th Group being lifted on board an Air Force HH-60 Pave Hawk helicopter at the Utah Test and Training Range in November of 2007, during CSAR integration exercises. A 19th Group soldier provides security with a turret mounted M60 machine gun during a convoy stop in Asadabad, Afghanistan in 2004. Slovenian and 5th Battalion, 19th Special Forces Group soldiers practice explosive breaching techniques during a three-week Joint Combined Exchange Training exercise in Slovenia. In April 2007, the 5th Battalion of 19th SFG and troops from the 2nd Battalion were called to Operation Iraqi Freedom. The unit came home with no deaths and very few minor injuries. ^ "Keeping Track Of U.S.S Special Ops In Africa". Huffington post. 6 September 2016. ^ "Green Beret killed in Afghanistan was new father". Stars and Stripes. 7 January 2016. ^ "FM 3-05.102 Army Special Forces Intelligence" (PDF). July 2001. Archived (PDF) from the original on 28 May 2008. Retrieved 7 June 2008. ^ Neville, Leigh (2015). Special Forces in the War on Terror. Osprey Publishing. ISBN 978-1472807908. ^ "Green Berets honored with Silver Star and eight other valor awards". army times. 6 May 2016. ^ "US servicemember killed in Helmand was part of major operation against Taliban". Stars and Stripes. 6 January 2016. Wikimedia Commons has media related to 19th Special Forces Group (United States). "California and the Global War on Terrorism, Company A, 5th Battalion, 19th Special Forces Group (Airborne) in Afghanistan". californiamilitaryhistory.org. The California State Military Museum. Archived from the original on 18 February 2018. Retrieved 11 September 2018.